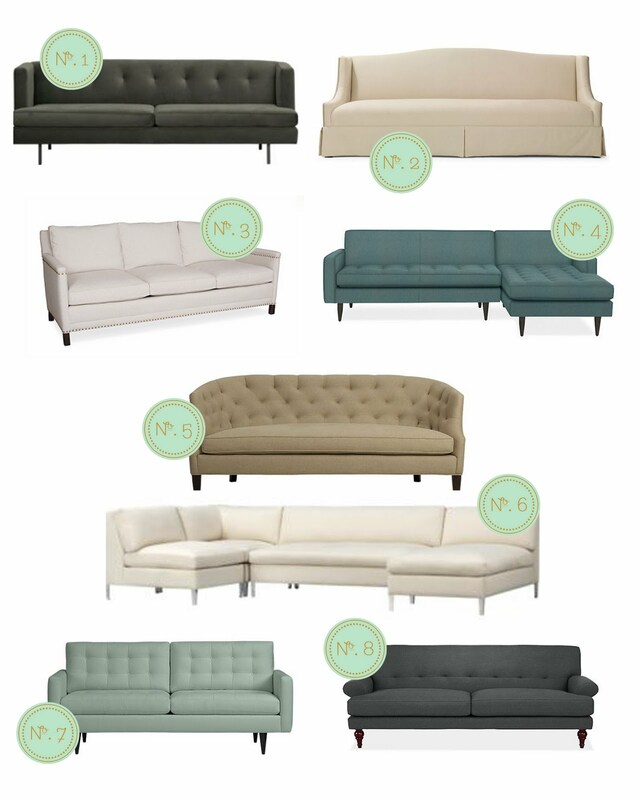 this week i'm totally smitten about couches. the reason being that we just put an offer on a house that i am SUPER in love with (like, i'm trying not to think about how big of a gamble it is to put an offer on a house that you love so much because there's no for sure way you're gonna get it). we've only been looking for 3 weeks and this is our first offer. every time i think about the house and my heart skips a beat i try to convince myself that it probably won't work out just so i don't get my hopes up. the only trouble is that i have no idea what stylistic direction i would go if i were ever faced with buying a piece of furniture because i love it, since pretty much everything we have has been given to us. i'm super bi-polar when it comes to style. one day i totally LOVE the vintage/traditional style with shabby sheek touches and the next i'm head over heels for modern, clean lines with more of a retro look. this is a dilemma for me since i have no idea how to mix and match the two. No. 1} this avec sofa looks like it wouldn't be comfortable and is a little more on the modern side than i would like, but is more reasonably priced. No. 2} i sort of dream of having a more formal living room where i can serve tea or something ritzy like that on this more traditional sofa. No. 3} this one looks comfy AND edgy with the hammered nails. although there is NO WAY my Mr. would go for a white couch. No. 4} i love the retro look of this reese sofa from room & board. you could just find me on the chaise for family movie night. No. 5} this is GRAND. No. 7} i've loved this sofa for several years now. when you just love something you can't explain it. so basically i love tuffed backs and seats, and my house is gonna look ridiculous. great. i realize pretty much none of these are in my price range. something that is more in my price range would be, say, something found in a thrift store that i attempt to reupholster myself... or something we buy used off Craigslist. but for now i'll be dreamin'. you know, like that Selena song, "i'll be dreamin', of you tonight. til tomoooooorrrrrrooow, i'll be holdin' you tight." i know i just got that song stuck in your head. and there's noooowhere in the world I'd rather beeeee...than here in my room...dreaming about, you and meeeee!